We can seal, re-sand, pressure wash and remove chewing gum from all paved areas. We are able to protect your paved surfaces by applying the patented “Resiblock” system that is renowned for being hard wearing and resilient to oil stains and detritus. We clean driveways, patio areas, building entrances, and internal courtyards – in fact anywhere that has a stone finish! 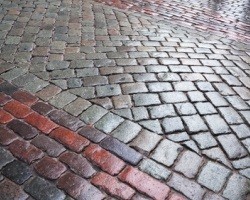 Call Revolution Support Services today to discuss your paving restoration requirements.